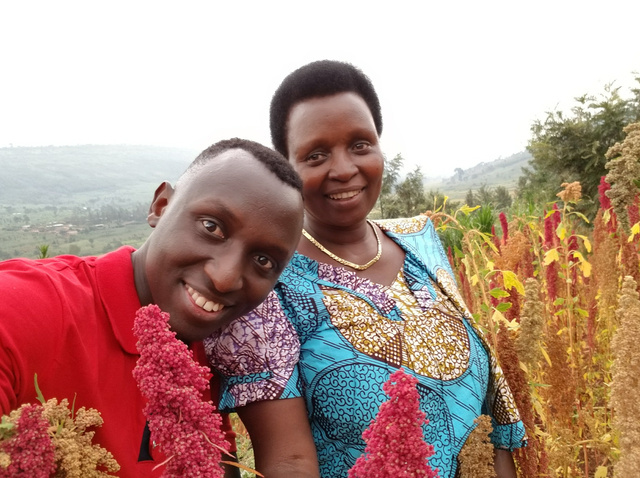 Cedric Habiyaremye and his mother, Agnes Mukankwaya, on a quinoa farm in Rwanda. The Ph.D. student at Washington State University started his project to popularize the crop in his home country last year. He had researched which varieties would grow best in Rwanda's environment in an earlier program. And local farmers found quinoa easy to grow. But Habiyaremye doesn't want to hand over the seeds to just anyone yet. He wants to make sure that farmers know that quinoa must be washed several times before eating it. "Quinoa has [a compound] called saponin, which is very bitter. 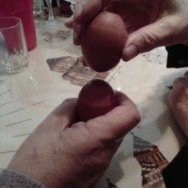 If they eat it without washing it, they will be disappointed." Habiyaremye is happy to report that his Quinoa Model Farmers Project, which distributes varieties of quinoa seeds to Rwandan farmers and trains them to grow, harvest and cook it, now has 209 participants, up from just 12 in March. In May and June, a couple of Rwandan news stories profiled his project — and it ignited a quinoa craze across the country, he says: "After those articles were published in the Rwandan media, it created a high demand for the seeds nationwide." "It brings the biggest smile and joy to my heart," he adds. Despite the fervor, he wants to take things slowly and strategize with the project participants, he says, making sure they know how to prepare quinoa properly after harvest. While the farmers are testing out the quinoa on a small scale now, Habiyaremye has big plans for the crop in the future. "I don't want people to just grow quinoa in the country for a year or two and then stop, or lose interest," he says. "I want them to understand how to incorporate quinoa in their existing farming system. And that starts with education." Through the project, farmers receive a quarter pound each of three quinoa varieties to yield up to 5 pounds of quinoa, free of charge. It's enough for farmers to grow quinoa in their farms year-round and share seeds with others in the community, he says. His efforts to bring quinoa to Rwanda have brought him to the international stage. In July, the Chicago Council on Global Affairs, a think tank, asked him to serve as the youngest member of a global agriculture task force, which includes big names like Ertharin Cousin, the former executive director of the World Food Programme (WFP). "Cedric embodies the entrepreneurial, resilient spirit that is needed to transform the agricultural sector," says Vanessa Taylor, assistant director for the group's global food and agriculture program. "His compelling personal story, connection to smallholder farmers and research interests in agronomy and crop science make him a valuable addition to our task force." That personal story starts when he he was a boy. His family fled to a refugee camp in Tanzania during Rwanda's civil war. The WFP provided meals to people in the camp, and when Habiyaremye saw the trucks coming, he said that he was full of joy because it meant he'd get to eat. "It's so crazy!" says Habiyaremye. "Life is what you make of it, you know? If you're positive, you'll attract positive people. I didn't let my circumstances [being a refugee] define me — and I think that's what brought all these opportunities to me." Meanwhile in Rwanda, Habiyaremye's biggest quinoa supporter — his mom, Agnes Mukankwaya — continues to evangelize the crop in her community. She just discovered she could make a kind of flour by drying up the leaves and grinding it. "You know how people sprinkle sesame seeds on food? She does that with the quinoa meal," he says. "Now I've started to do that, too!" Her peers call her the Queen of Quinoa, says Habiyaremye. And what does that make him? "If she is the Queen," he says, "that makes me the Prince."